In the technology itself, many advances also pushed lab automation ahead. For example, liquid handling can now employ ultrasonic noncontact techniques. The instrumentation can run advanced methods, like the digital polymerase chain reaction and automated microscopy for high-content cell analysis. Plus, the computer science side continues to make many aspects of automation easier. “Clusters and cloud computing mean that computability is no longer an issue for all but the most esoteric or bold problems in modeling,” Pechter explains. The Microlab VANTAGE Liquid Handling System lets scientists customize many aspects of workflows.Image courtesy of Hamilton RoboticsEven as automation gets easier to use, many platforms make it possible for scientists to create customized workflows. When asked about the latest advance in automation from Hamilton Robotics (Reno, NV), product manager Del Ray Jackson says, “With the newest version of INSTINCT V software—used to control the Microlab VANTAGE Liquid Handling System—the realm of workflow customization extends beyond robotic and deck configurations.” Through a graphical interface, scientists can build processes that, Jackson says, “tailor actions to the assay type.” This software even provides 3-D simulations of a process, which helps users see just how it would work. The robotics in a lab also need to be connected to software, but it needs to be designed for this kind of work. 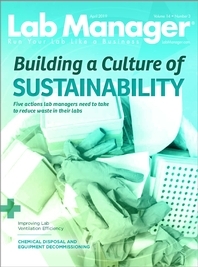 As an example, Steve Yemm, CEO at Biodata (Cambridge, MA), says that his company’s Labguru—a web- and cloud-based electronic lab notebook—was developed for “integration with laboratory instruments that allows us to capture data directly from them.” That process uses a scientific data management system solution called Labguru UpFolder. “This allows us to connect Labguru to plate readers, for example, and in this case, it captures a CSV file from the plate reader and inserts it directly into a Labguru experiment,” Yemm explains. This system can compile the data for statistical analysis. For example, an R-based analysis can fit a dose-response curve to the data points and calculate various metrics, including line slopes and intercepts. The analysis can also determine values like the IC50, which is an efficacy measure that is often used in drug discovery research. It’s not just devices, software, and samples that must work together in an efficiently automated lab. How scientists work with all that technology, and maybe together, comes into play as well. Even robotics can be designed for improved teamwork. “Collaborative robots are designed to work alongside scientists in a shared environment,” says Dean Mulyk, product manager, lab automation solutions, at Thermo Fisher Scientific (Waltham, MA). “While they have led to systems that are more open, they haven’t fundamentally changed the human interaction with automation.” That could change with the Thermo Scientific inSPIRE, which is a collaborative system. “The touch-enabled inSPIRE incorporates innovative features to provide scientists [with] an automation system that truly partners with them,” he says. Making the best collaborative system starts with that concept in mind. “The inSPIRE is designed from the ground up to work well with humans,” says Mulyk. For example, it includes touch-enabled control through which users can share access to instruments using the SmartHandle. “The SmartHandle’s color changes based on whether the user or the robot is in control of the instrument,” he explains. “The color changes combined with haptic feedback allow users to intuitively take control of an instrument by swinging out the SmartShelf.” When the user is done, just return the shelf and the Thermo Scientific Momentum control software puts the instrument back online. Sometimes, robot-advancing collaboration comes from company teamwork, such as Bruker BioSpin (Billerica, MA) teaming up with UK-based TTP Labtech. Bruker Biospin’s Lab2NMR—an automated system for scheduling nuclear magnetic resonance (NMR) samples—integrates TTP Labtech’s lab2lab, which pneumatically transports barcoded samples. “In many pharmaceutical and chemistry laboratories, individual scientists need access to analytical equipment such as HPLC, LC-MS, and NMR to perform analysis on their samples,” says Sandra Wiktor, technical product manager, automation, at Bruker Bio- Spin. “Such analytical instrumentation is often complex, very specialized, and expensive; therefore, it is grouped in analytical laboratories—or centers—throughout facilities.” That means that scientists must manually transport samples to their closest analytical center to be queued for analysis. The problem is that this center may not have the optimal instrument selection or the sample queue may be very long, lengthening time to results. However, this can be alleviated with lab2lab. “The system enables scientists to send samples from their own laboratories, allowing [it] to prioritize resources, select the best instrument for the task, and analyze samples much more efficiently, there[by] optimizing instrumentation time,” Wiktor explains. The Lab2NMR system with the integrated lab2lab transports prepared samples dissolved in dimethyl sulfoxide-d6 in 2-D barcoded vials from any chemistry lab to a centralized robotic station. There, the system puts the sample in an NMR tube and transfers it directly to the NMR probe. A scientist can keep track of the process through automated emails or text messages, which even provide warnings if a solvent needs refilling, a source rack is empty, or a waste rack is full. New innovations in laboratory automation and connectivity are making their way to the clinic. For example, BD Diagnostic Systems (Franklin Lakes, NJ) offers a line of modular microbiology laboratory automation solutions. “The BD Kiestra products are customizable, automated modules ranging from standalone pieces to total lab automation solutions connected through the scalable and secure BD Synapsys informatics solution,” says David Newsome, global marketing leader, lab automation, for BD Diagnostic Systems. “The modular approach allows clinical microbiology laboratories to automate either specific steps or the entire workflow.” For instance, these systems include modules for sample processing, incubation and imaging, culture reading, and interpreting images. The BD Kiestra provides modular capabilities in automation, from standalone pieces to total lab automation solutionsImage courtesy of BD Diagnostic SystemsIn microbiology, a BD Kiestra system streaks plates with a rolling bead. This technique generates “three to five times more isolated colonies than any loop-based method,” Newsome says. The isolated colonies can be identified and used in antibiotic susceptibility testing. This workflow can be combined with BD Kiestra Optis technology to capture images. “New solutions will enable more robust processing of clinical samples and faster, more comprehensive reporting of results back to clinicians,” he adds. 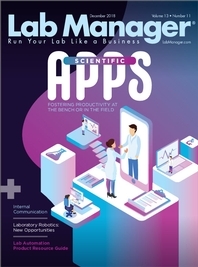 Indeed, as connectivity using robots, AI, and other tools becomes more robust, the applicability of these solutions across clinical laboratory settings will become more ubiquitous. In fact, lots of things have been changing for some time in robotics for lab automation. As Olsen recalls, “When I started in this area, a person had to be a mechanic, programmer, metrologist, and tinkerer, and have a good sense of humor.” Some of those skills still come in handy for many scientific endeavors, but lab robotics sure make it easier for scientists to laugh their way to the results.